This is a malleable recipe. Use whatever veggies are in season or what you have readily available. Here in Southern Oregon we have a lot of seasonal options so I've listed substitutions and ideas to accomplish textural differences and flavors. 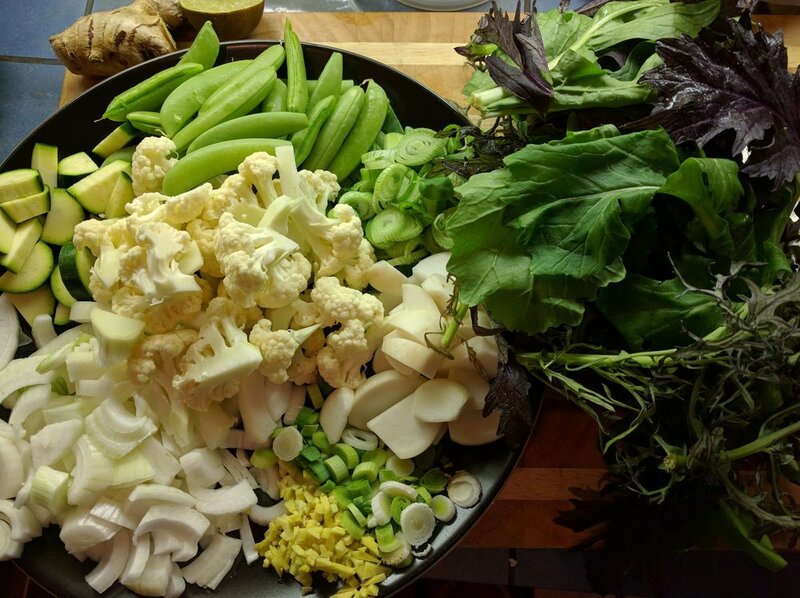 There's a lot of chopping veggies, but other than that is rather simple. The trick is to start with just chopping all the veggies and setting them on plates ready to cook. Then cook each set of veggies separately and toss it all together in a big bowl. Cooking in batches makes it so that certain veggies don't get mushy, and you have more final product than just doing it in one pan or wok. This recipe can make a heap of food for a small party, potluck or family. You can increase amounts of veggies and seasonings too if you need to feed a lot of people. Or, if you like having healthy food for multiple meals, this makes great leftovers. 1. Chop all veggies in appropriate sizes. I like to slice carrots, celery and most veggies at an angle, about 1/8 to 1/4 inch thick. 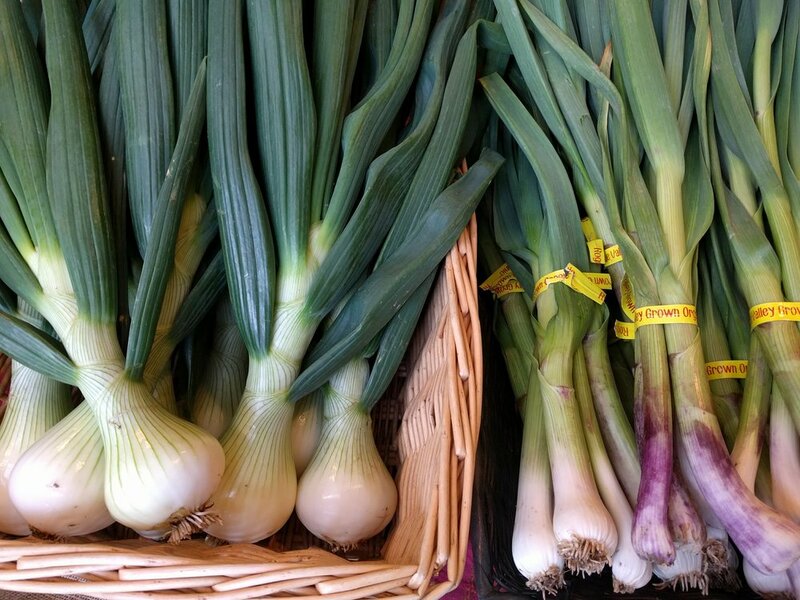 Onions can be in larger pieces. Set aside with each type of veggie separate for adding at different cooking times. 2. Peel and chop ginger and garlic. Set aside in it's own dish. 3. Chop scallions, basil/cilantro/mint. Divide green parts of scallions and set aside with other herbs for garnish. 4. Remove ground yak from package and form into balls, about 1" to 1.5" in diameter. Set on a plate aside. Rinse and cook the rice as per usual instructions on another burner as you get the veggies started. 5. Set a non-stick pan (or cast iron, but more oil may be needed) over medium/high heat and add 1-2 Tbsp oil. The pan should be really hot but not smoking. 6. Add chopped onions and cook for a few minutes, then add the carrots (if using) and cook a few more. Then add the celery. Toss or stir every minute or so, browning but not burning the onions. Cook until a bit translucent, a bit browned but not until they turn really soft. The celery and carrots should still have a bit of crunch. Remove from heat and spoon into a large stainless bowl or pot. 7. Return the pan to heat and add another 1-2 Tbsp oil. When hot, add the Szechuan pepper, ginger and garlic. Toss or stir for a couple minutes then add the gai lan/broccoli/cauliflower. Saute and add a little water to cook and steam the veggies. When the broccoli has a bit of crunch still but is cooked, spoon into the same large bowl or pot. Stir the veggies in the bowl to distribute flavors. 8. Return the pan to heat and add a little oil. When hot, add the mushrooms (if using) and stir. Add the black pepper, then add the fennel/ kohlrabi/ water chestnuts/turnips/jicama options. Stir and cook. Add a little water if necessary. When the mushrooms are cooked through and the veggies are cooked but still crunchy, remove and spoon into the bowl. 9. 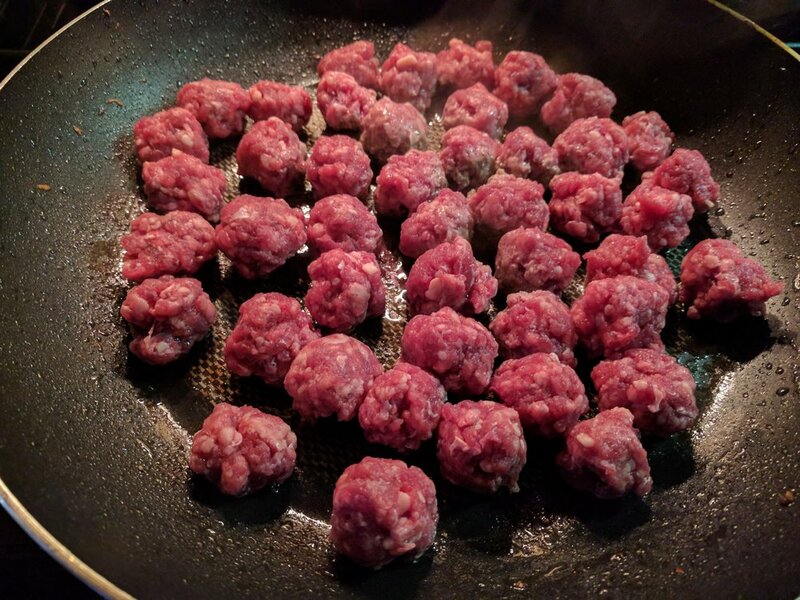 Set the pan on med/high again and add the yak meat balls. Brown each side lightly, cooking to medium-rare. Yak cooks quickly, so be careful to not overcook. Add to the bowl, leaving any residual fat in the pan. 10. Return the pan to heat. If you want the sauce to be thicker, mix some cornstarch with the Indonesian sweet soy, soy sauce and fish sauce. Then add to the pan and cook for a few minutes. If not using cornstarch, (which is not really necessary), just add the peas, white parts of the scallions and nuts if using. Cook for a couple minutes then toss all ingredients together. Add the basil/mint/cilantro/scallion tops and stir again. The rice can either be added to the veggies and stirred in, or served beneath the vegges, depending on your preference. Copyright 2019, Firebird Farms. All rights reserved.